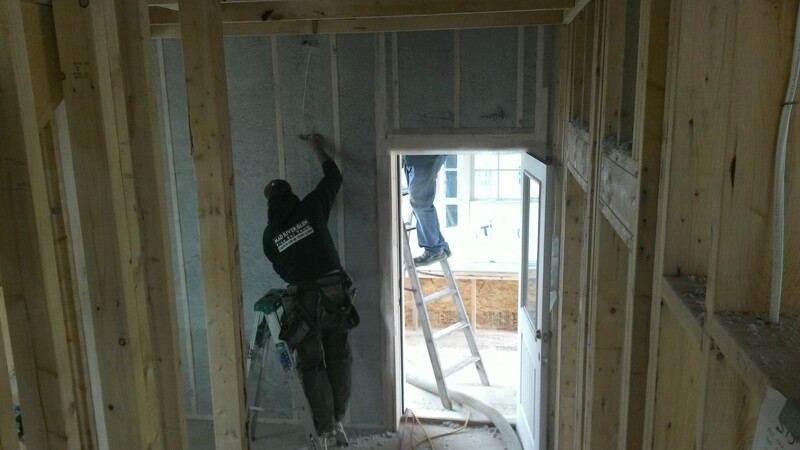 Bugbee Insulation spent all week stuffing cellulose into the first and second floor exterior walls. It’s tedious work: one person in a truck breaks the insulation off compacted blocks and into a vacuum hose, and another crew member inside the house directs the other end of the hose. When a portion of wall is filled and bulging, they remove the hose and compress the cellulose back into the wall. They repeat this process over and over, day after day… makes me glad I’m not an insulator. 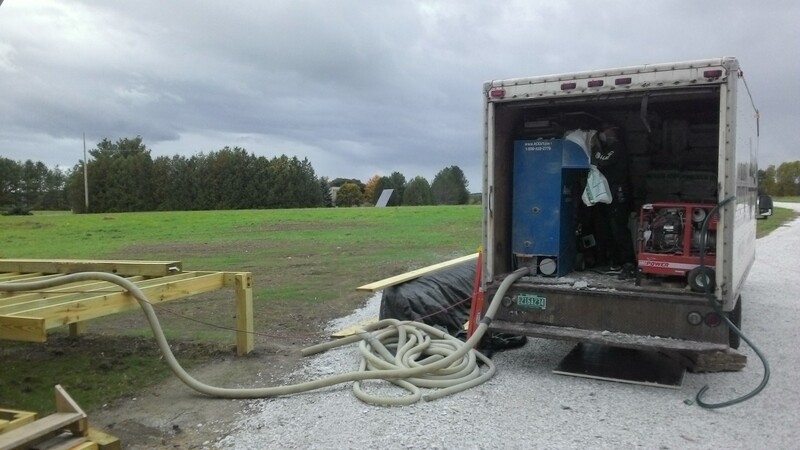 Unloading cellulose from the Bugbee Insulation truck into a vacuum hose. Their generator is very loud. Instead, Terry and Colin and I spend these glorious autumn days outside. We built a roof on the breezeway and enclosed the walls, so it has become very much a part of the home. 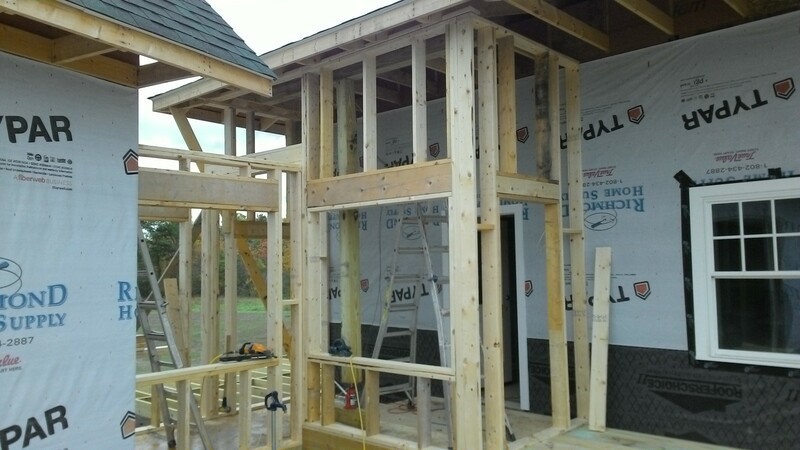 Colin assembled the roof trusses: two rafters and a ceiling joist, cut on an angle to match the desired roof pitch. (A 4-on-12 pitch corresponds to an angle of 18½ degrees, in case you were wondering.) He cut the last pair of rafters specially to match the Barn’s 15-degree skew, and nailed them directly to the Barn. We had to jack up the shed roof to squeeze in the second top plate for the breezeway walls. 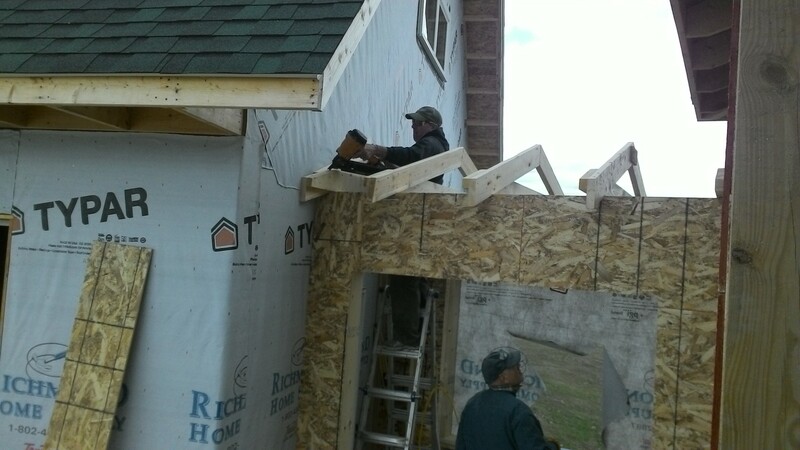 Installing the skewed rafters over the breezeway. Terry cut plywood for sheathing the breezeway walls and for subroofing; I nailed and routed. Then we stapled our moisture barriers (Typar and Roofer’s Choice), and I stuck Ice & Water Shield on both ends where the roof meets the walls. 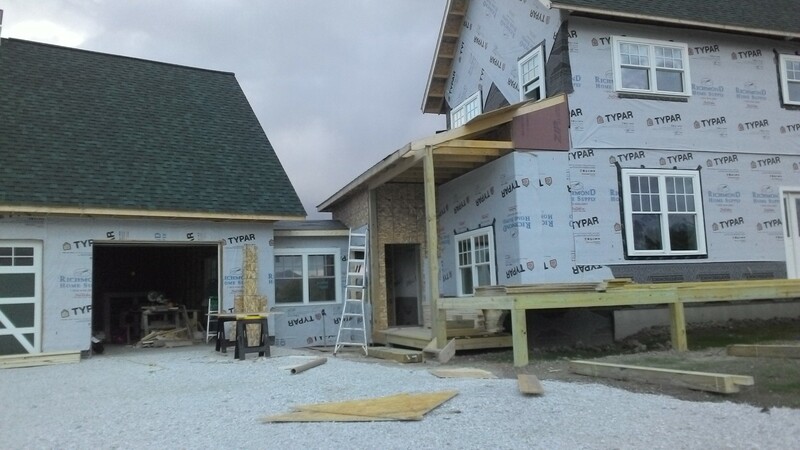 We’re masters at installing windows, especially ground-level ones, and the breezeway’s three went in easily. Breezeway window. Camel’s Hump is still there! The breezeway roof enabled Colin to run electrical cables from the house to the Barn. He kept them neatly organized with zip-ties and fit them inside the trusses. 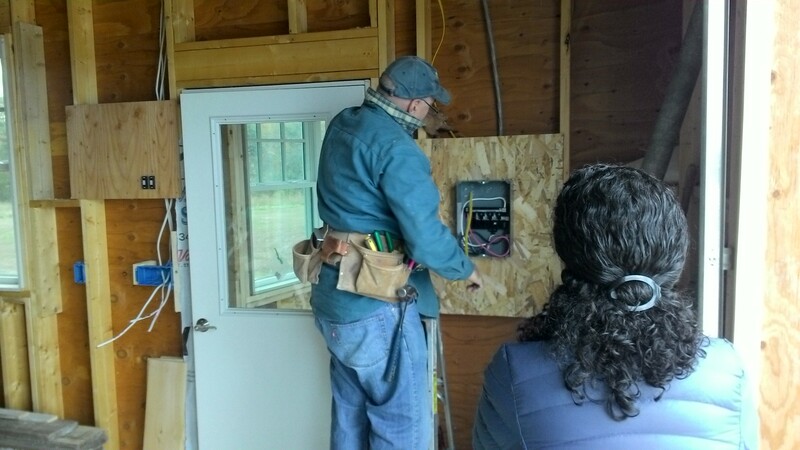 The Barn gets power from one master circuit breaker on the main panel in the basement, but Colin installed a secondary panel to split it into three circuits. Cables now run from the outdoor pedestal just north of the Barn, under the driveway, through the basement to the main electrical panel near the south wall of the house… then all the way back to the Barn, through the secondary panel, and across the ceiling leaving a stub for an outdoor light back on the north wall. One begins to understand how the electrical systems for this single house have consumed over a mile of cable. Who’s the boss? Abby watches Colin install the secondary electrical panel. Terry runs cable out the breezeway… WAY harder now that the walls are stuffed with insulation. We also went full steam ahead on the front porch. Laying out the posts, Colin discovered with delight that a 12-foot spacing misses every door and window, giving him unimpeded views and maximum curb appeal. The deck received a second plate, and then the posts went up with temporary bracing. Terry prepped rim joists to tie the posts together while I found other small tasks to accomplish. When we raised the rim joists, they fit into the notched posts perfectly aligned and level… oh, what a joy. 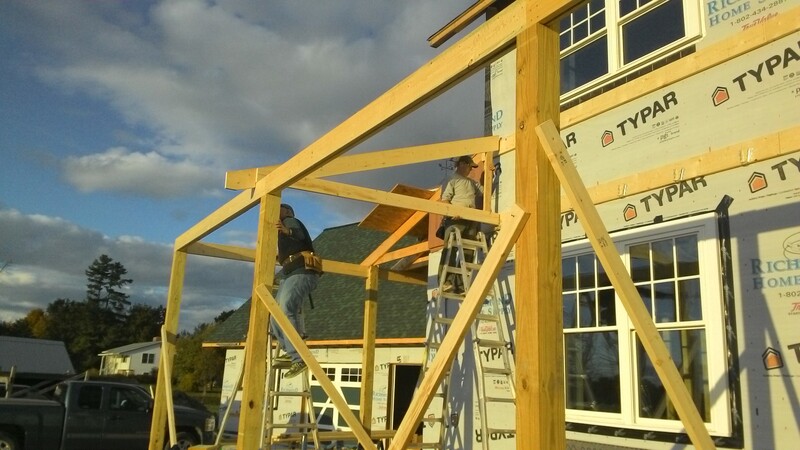 Here’s the first roof truss over the front porch. Stay tuned for many more.